Recently, with multimedia services such as IPTV, video conferencing has emerged as a main traffic source. When UDP coexists with TCP, it induces not only congestion collapse but also an unfairness problem. In this paper, a new Active Queue Management algorithm, called Traffic Sensitive Active Queue Management (TSAQM), is proposed for providing multimedia services in routers. The TSAQM is comprised of Dynamic Weight Allocate Scheme (DWAS) and Service Guarantee Scheme (SGS). The purpose of DWAS is to fairly allocate resources with high end-user utility, and the SGS is to determine the satisfactory threshold (TH) and threshold region (TR). Besides, a multiqueue design for different priority traffic, and threshold TH and threshold region TR is proposed to achieve the different QoS requirements. Several objectives of this proposed scheme include achieving high end user utility for video services, considering the multicast as well as unicast proprieties to meet interclass fairness, and achieving the QoS requirement by adaptively adjusting the thresholds based on the traffic situations. Performance comparisons with the GRED-I are in terms of packet dropping rate and throughput to highlight the better behavior of the proposed schemes due to taking into account the fairness and different weights for video layers. To improve the congestion collapse problem, the early TCP protocol prompted the study of end-to-end congestion avoidance and control algorithms . Recently, several applications, such as IPTV and VoIP, using User Datagram Protocol (UDP) without employing end-to-end flow and congestion control, are increasingly being deployed over the Internet. When UDP coexists with TCP, it induces not only a congestion collapse problem but also an unfairness problem that each flow cannot get the same treatment, causing an unstable Internet and lower link utilization. The congestion control methodologies can be categorized as the Primal and the Dual . The Primal congestion control is the source node dynamically adjusting the sending rate or window sizes depending on the indication information fed back from the Internet. Due to the limitations of Prime methodology, the Dual plays a more important role through assisting in the provision of more accurate and quick feedback. The congest control algorithm for Dual is implemented in routers gathering traffic flow information, such as flow numbers and traffic load, and sends implicit or explicit feedback to the sender or receiver node for revising the sending rate or making active queue management. The multimedia streaming applications, such as IPTV and video conference, have emerged as one of the main traffic sources with less tolerance for delay and jitters. Usually, the scalable layered coding (SVC)  technique is used to increase the end-user utility under diversified environments. The SVC is an extension of H.264/AVC using the layered structure scheme to generate multilayer with one base layer and several enhancement layers. Therefore, a receiver can subscribe an appropriate scenario based on the network status and required transmission quality. To ensure the efficient use of network resources, this kind of application adapts the multicast technique to deliver the contents. Besides, the multicast service over a wireless environment results in enhanced resource efficiency and reduced transmission power consumption due to the wireless multicast advantage  property. When the wireless technique is mature enough to be the last mile solution, the IPTV multicast services under the wire and wireless environments, such as the integration of EPON and WiMAX , will become a trend. However, all the proposed active queue management mechanisms do not consider the multicast services, and the proposed algorithms assume the same weight for unicast and multicast connections. However, this is unfair for the multicast connection, which will cause poor system performance in light of the entire network average video quality. Therefore, in this paper, we will propose a QoS-aware active queue management method with multiqueues multithresholds, in which the property of video coding as well as multicast delivery is taken into account in one shot. The rest of the paper is organized as follows. Section 2 surveys the related works. The system design is described in detail in Section 3. The system performance is analyzed and discussed in Section 4. Finally, the paper draws the conclusions in Section 5. The Primal methodology has two types, which are classified based on the way of reaction to congestion, adjusting the congestion window size, termed Window-Based, or the packet transmission gap, termedRate-Based. The Rate-based is more suitable for delivering real-time traffic because it can provide a more smooth transmission rate and it has no need to wait for an ACK message from the receivers [6–8]. The Primal methodologies [9, 10] use the fluid model to analyze the Internet traffic load or use probing-based methods including the probe gap model (PGM) and probe rate model (PRM) to estimate the residue bandwidth in the bottleneck [11–13]. In essence, those algorithms regarding the amount of packet loss and value of RTT's variation imply that network congestion occurs. However, the packet loss is not only due to congestion occurrence but also the environment interference, that is, fading or interference in the wireless channel or high bandwidth delay environment. The Dual methodology, Active Queue Management (AQM), can be divided into two main categories including the closed-loop control and the open-loop control depending on whether the algorithm uses feedback information. For closed-loop control, the most well-known proposals are RED, Adaptive-RED (ARED) , and BLUE . The RED's main idea is using two predefined thresholds, minimum and maximum thresholds to separate the queue length as three congestion grades and adjust the packet dropping rate according to different situations. The ARED dynamically adjusts RED's thresholds based on the observed queue length and tries to maintain the queuing delay within a target range. BLUE  uses packets loss and link-idle events as the critical factors to adjust the packet dropping probability rather than the queue length. In the open-loop control, the most promising proposals are RAP , XCP , and its extended researches [18, 19]. The main objective of this category is to achieve the incoming data rate equal to the output link capacity of the router, and each traffic flow is allocated the same bandwidth simultaneously ensuring lower queue sizes. This category can eliminate the high bandwidth-delay product network effect on the TCP's throughput, which is inversely proportional to the RTT, to satisfy the TCP-friendly property . However, the above congestion control algorithms only adopt the homogeneous fairness resource allocation method. The studies [20–22] alleviate this problem by modifying the AQM design. In , the proposed algorithm rearranges the order of packets in the queue of the router and dynamically adjusts the packet dropping rate and the target queuing average size based on the packet arrival time, incoming traffic's requirements, and delay hint. The study in  uses three levels of RED to emulate the class-based design that each level sets parameters according to different traffic requirements and based on that determines if the incoming packet is accepted. The research in  provides different dropping rate adjusting algorithms for TCP and UDP with TCP-friendly property for the diversity traffic characteristics. However, the above surveyed algorithms cannot satisfy the delay and throughput requirements simultaneously since it only adopts one-queue design for all types of traffic. In regard to delivery video, several researches [23–26] utilize the video coding technique to improve throughput and end-user utility when congestion occurs. In view of the video coding technique, the literature in  concerning XCP extending research adds an addition header field to record how many resources have been assigned to each flow so the sender can know which layers should be delivered. In the literatures [24–28], they support different QoS using priority dropping queue management and a packet marking technique. In , the authors adopt the SCED+ scheduler for guaranteeing the delay requirement. In researches [19, 25–30], the proposed various algorithms satisfy the QoS requirements by utilizing the scheduler and marking technique. However, it is too complex and results in additional process overhead in the router. In summary, current AQM algorithms have the following problems: (1) most algorithms cannot achieve the delay and throughput requirements simultaneously. On the other hand, some AQM algorithms can satisfy each traffic type's requirement, but those algorithms are too complex and unsuitable for high traffic load, causing heavy computing overhead. (2) The above mentioned algorithms barely consider the video traffic characteristics that only adopt the homogeneous fairness bandwidth allocation policy. (3) They do not consider the multicast service property, thus leading to low bandwidth efficiency and poor system average video quality. (4) Current AQM algorithms only utilize the adjusting packet dropping rate to overcome the congestion problem. However, it should not only adjust the packet dropping rate but also consider the congestion level, and the AQM will be more efficient in reacting to various traffic loads. (5) Most AQM algorithms do not have the adaptability, and those algorithms have to be trained or adjust a set of parameters to meet the diverse traffic load and router link capacity. It is a challenge to overcome the congestion problem to consider the video coding technique, bandwidth efficiency, and different traffic's QoS requirements for more outstanding performance. In this paper, the Traffic Sensitive Active Queue Management (TSAQM) scheme is proposed to overcome those problems. Several objectives of this proposed scheme are described as follows: first, a Dual methodology congestion control algorithm is proposed to meet the QoS requirement of different services using the multiqueues multithresholds mechanism cooperating with the weight-based scheduler algorithm; second, it achieves high end-user utility for video service; third, it considers the multicast as well as unicast proprieties to meet interclass fairness; fourth, it has the ability to adaptively adjust the parameters of TSAQM according to the time-varying traffic loads. The system design, as shown in Figure 1, has four types of traffic including UDP CBR (constant bit rate) traffic, UDP VBR (variable bit rate) multicast traffic (MVBR), UDP unicast traffic with VBR (UVBR), and TCP traffic. The threshold TH denotes the mean of maximum and minimum thresholds; the threshold region TR denotes the value between maximum and minimum thresholds. The Traffic Sensitive Active Queue Management (TSAQM) with Dynamic Weight Allocate Scheme (DWAS) and Service Guarantee Scheme (SGS) is proposed for QoS-aware active queue management. Based on Figure 1, the four queues with four thresholds and weight-based scheduler are proposed; in addition, four individual FIFO queues, , are set for different traffic classes, , respectively, where the traffic class is the UDP traffic with CBR ( ), the traffic classes and are the multicast and the unicast UDP traffic with VBR, and the traffic class is TCP traffic. For traffic types of VBR, each flow contains VL video layers and the bandwidth of each layer is denoted as . The arrival rates and service rates for different traffic classes are and , and the QoS requirement vector is denoted as , including the delay, packet dropping rate, and throughput. Since the performance of GRED-I  is better than both RED and GRED [32, 33], each queue applies GRED-I buffer management with threshold TH and threshold region TR for different traffic classes in the proposed TSAQM scheme, in which threshold TH and threshold region TR denote the vector of each queue's threshold and threshold region, respectively. The purpose of the threshold for different traffic classes, , is estimated to determine the packet dropping rate, and the threshold region for different traffic classes, , where the with threshold range for different traffic classes, , is cooperated with TH to estimate suitable parameters for current traffic conditions. Further, to achieve effective resource utilization, the dynamic weight-based scheduler is adopted with weights for different traffic classes, , as a scheduler mechanism. The system terminologies are summarized in Table 1.
is the CBR UDP traffic class, and are the multicast and the unicast VBR UDP traffic class, and is the TCP traffic class. Vector of each traffic class's arrival rate. Vector of each traffic class's service rate. Vector of each traffic class's QoS requirement. Constant bitrates traffic's requirement bandwidth. Number of video layers including one base layer and VL−1 enhanced layers. Vector of SVC video source's each layer requirement bandwidth. Vector of each queue's threshold. Vector of threshold region . Vector of the threshold range cooperated with TH as the reinitiated TSAQM critical term. Vector of each queue's scheduler weight. The flowchart of TSAQM, shown in Figure 2, has two main tasks: one is to allocate resources with fairness and high end-user utility in the Dynamic Weight Allocate Scheme (DWAS), and the other is to determine the satisfactory threshold (TH) and threshold region (TR) in the Service Guarantee Scheme (SGS). The DWAS is used to allocate bandwidth and adjust the weights mechanism of for different traffic classes to achieve better resource utilization. Differential service fairness delimitation, termed Differ-TCP-Friendly, is proposed to provide the minimum requirement of each class first and then distribute residue bandwidth for TSAQM. Then, the thresholds (TH) and threshold regions (TR) are determined by a one-dimensional Markov-chain model in the SGS to precisely adjust the thresholds to meet the QoS requirement of each traffic class. The parameter terminologies are summarized in Table 2. Used for adjusting the threshold of throughput-sensitive traffic. From the previous update to the present time of the delay-sensitive traffic class. From the previous update to the present time of the throughput-sensitive traffic class. Unit of the adjusting threshold for the delay-sensitive traffic class. Unit of the adjusting threshold for the throughput-sensitive traffic class. Vector of active connection(s) for each traffic. This flag is used to indicate the queue's growth trend. 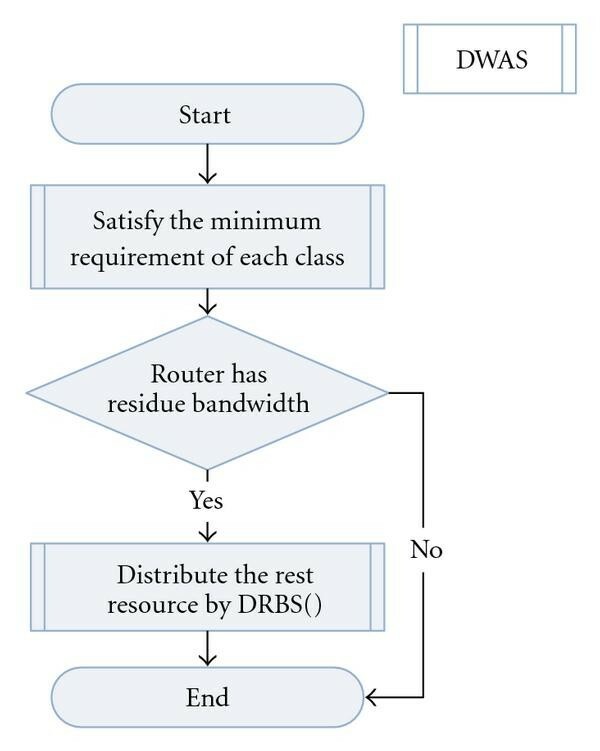 The DWAS, shown in Figure 3, has two phases: the first is to satisfy the minimum throughput requirement of each traffic class, and the second is to use the DRBS (Distribute Residue Bandwidth Scheme) to distribute the residue bandwidth with Differ-TCP-Friendly to all traffic classes, except the CBR traffic. The DWAS distributes bandwidth to traffics based on the traffic priority and current active connections, , for different traffic classes. The traffic classes , and have the property that the data rate is constant or has staircase-like bit rates, and traffic class, , is throughput sensitive without a minimum throughput requirement. However, to satisfy the Differ-TCP-Friendly, the DWAS allocates bandwidth to traffic class, , using the assumption that the minimum requirement of traffic class, , is the maximum throughput requirement of CBR and VBR. The DWAS algorithm is shown in Algorithm 1, in which the allocation procedure is in order. The bandwidth allocation unit for VBR traffic is the bandwidth of each layer of SVC. In DWAS, only the bandwidth of the first video layer is allocated, that is, lb1, to meet minimum requirement of and . For , the bandwidth is allocated as the maximum of both lb1 and in DWAS. If there is residue bandwidth, then DRBS is executed. The final step of DWAS is to normalize the weights of each traffic type. The purpose of DRBS is to allocate the residue bandwidth in lb2, lb3, and lb4 order. While all the layer's bandwidthes are met or the residue bandwidth is insufficient for any class's requirement, the resource will be equally divided to all traffic classes, except CBR traffic, based on the proportion of current active connection(s). The details of the procedure of the DRBS algorithm are shown in Algorithm 2. The SGS algorithm is shown in Algorithm 3. If the incoming traffic class, , is delay-sensitive traffic, it checks that the trend flag, , is in a decreasing trend (higher than the upper bound) or an increasing trend (less than lower bound of threshold region). When the trend flag indicates that the situation is decreasing, then the threshold, , subtracts ; otherwise, it adds , where is the adjusting TH unit. Then, the SGS verifies the adjustment outcome using the Quality Verification (QV) function to verify whether the current threshold setting meets the required QoS. where and are the average number of connections and service rates of traffic class , respectively, and are the number of current active connections and arrival rates of the th record, respectively, and PN is the history data quantity from the previous update to the present time. Algorithm 4: QV and MBL functions. The TSAQM monitors the system condition and, based on the result of the threshold region information, determines the proper moment to update the system parameters. This can avoid unnecessary initiation, since there is no additional bandwidth for lower priority traffic, and the initial timing is defined in Table 3. The proposed algorithms are implemented in the routers; the network simulator 2 (NS-2) is used to estimate the performance of TSAQM and adopt the dumbbell topology as the simulation topology, shown in Figure 5, which there are sources, destinations, and two routers . The bandwidth between the source (or destination) and the router is 100 Mbps, and the bandwidth between routers is 10 Mbps. The buffer space at the router is set to 100 packets, as shown in Tables 4, 5, and 6 which show the parameters of traffic class and video source, respectively. The traffic arrival rates of four types follow the Poisson process. For the data rate of the CBR the reader is referred to . The VBR video source is the "HARBOUR" generated by JSVM , and the TCP traffic is generated as the FTP Traffic Model . 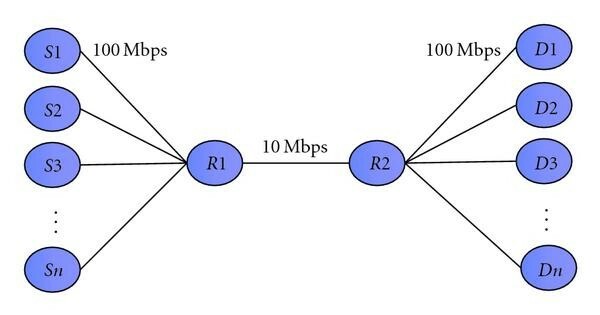 Based on Figure 5, the router is chosen to evaluate system performance in terms of the packet dropping rate, average delay time, and connection throughput as two simulation scenarios for different CBR and MVBR traffic arrival rates. Besides, the results of peak of SNR (PSNR) are given to estimate the impact on video quality. In this case, the arrival rate of CBR is varied from 0.06 to 0.14 (flows/sec), and the others are fixed and set to be 0.065 (flows/sec). Figures 6(a), 6(b), and 6(c) show the average packet dropping rate, delay time, and connection throughput, respectively, for different CBR arrival rates. (a) Packet dropping rate. (b) Delay time of the CBR, MVBR, and UVBR. (c) Throughput of the CBR, MVBR, UVBR, and TCP for different CBR arrival rates. Figure 6(a) shows the packet dropping rate of the CBR, MVBR, and UVBR for different CBR arrival rates. The average packet dropping rate of the CBR is always lower than the others and is maintained at about 0.005. This shows that the proposed TSAQM can achieve the dropping guideline of CBR traffic. The packet dropping rate of MVBR is lower than UVBR due to the DRBS distributing residue bandwidth to MVBR through threshold adjustment. When the UVBR dropping rate is about 15%, it means that the DRBS does not allocate the bandwidth to the 5th layer video stream. Where the arrival rate of the CBR is between 0.085 (flows/sec) and 0.095 (flows/sec), the UVBR dropping rate is about 23%, meaning that the DRBS does not allocate the bandwidth to the 4th layer video stream. The UVBR dropping rate is between 23% and 30%, and in the case of the arrival rate of the CBR being between 0.15 (flows/sec) and 0.105 (flows/sec), it means that the DRBS does not allocate the bandwidth to the 3rd layer video stream. Similarly, in the case of the arrival rate of the CBR being higher than 1.0 (flows/sec), the 5th layer video stream will be dropped for the MVBR. Figure 6(b) shows the delay time of the CBR, MVBR, and UVBR for different CBR arrival rates in which the proposed TSAQM can achieve the latency guideline of CBR and MVBR traffics. For the same reason, the delay time of CBR is the lowest and UVBR is the highest using the DRBS distributing strategy. When the arrival rate of CBR is higher than 0.1 (flows/sec), the delay time of UBVR is slightly higher than 150 ms. Besides, there are two reasons for the unstable delay time. First, the frame variation of the "HARBOUR" is more intense, meaning that the variation of entering queue rate is higher than the smooth one. Second, the proposed TSAQM uses the TR to avoid reinitiating because the burst traffic arriving will result in a higher TR value and cause a higher delay than the estimated TSAQM, especially for the heavy load case. Figure 6(c) shows the average connection throughput of CBR, MVBR, and UVBR and total throughput of TCP for different CBR arrival rates. This shows that the proposed TSAQM can achieve the required transmission rate for CBR, MVBR, and UVBR. The mean throughput of the CBR is about 64 kbps for different CBR arrival rates. Besides, where the arrival rate of the CBR is 0.085 (flows/sec), the throughput of TCP clearly increases because the 4th layer packets of UVBR are dropped, as shown in Figure 6(a). This is the same phenomenon for the case where the arrival rate of CBR is 0.1 (flows/sec). In this case, the arrival rate of the MVBR is varied from 0.06 to 0.14 (flows/sec), and the others are fixed and set to be 0.065 (flows/sec). Figures 7(a), 7(b), and 7(c) show the average packet dropping rate, delay time, and connection throughput, respectively, for different MVBR arrival rates. Performance comparisons with the GRED-I  are presented in terms of packet dropping rate and throughput to highlight the better behavior of the proposed schemes. (a) Packet dropping rate. (b) Delay time of the CBR, MVBR, and UVBR. (c) Throughput of the CBR, MVBR, UVBR, and TCP for different MVBR arrival rates. Comparing Figures 7(a) with 6(a), the packet dropping rates of the CBR, MVBR, and UVBR in Figure 6(a) are higher than those in Figure 7(a) because the data rate of MVBR is higher than CBR. Besides, the packet dropping rate increases more rapidly than in Figure 6(a) for the UVBR when the MVBR arrival rate is increased. However, the impact on MVBR is slight for an increasing MVBR arrival rate. Figure 6(a) also shows that, in the case of the arrival rate of MVBR being at 0.085 (flows/sec) and 0.1 (flows/sec), the DRBS does not allocate the bandwidth to the 4th and the 3rd layer video streams, respectively, for the MVBR. Figure 7(b) shows the delay time, of the CBR, MVBR, and UVBR for different MVBR arrival rates. This shows that the proposed TSAQM can achieve the latency guideline of CBR and MVBR traffic through the DRBS distributing residue bandwidth to them first. Comparing Figure 7(b) with Figure 6(b), unstable results are shown in Figure 7(b) for an arrival rate between 0.08 (flows/sec) and 0.1 (flows/sec). The reason is the same as varying the CBR arrival rate case that affects frame variation and the TR will be obvious because the MVBR traffic is increasing. Since the DWRR adopts the packet based scheduler, the DWAS will be affected since the packet size varies greatly, and it is more obvious than in Case 1. Figure 7(c) shows the average connection throughput of CBR, MVBR, and UVBR, and total throughput of TCP for different MVBR arrival rates. This also shows that the proposed TSAQM can achieve the required transmission rate for CBR, MVBR, and UVBR. The mean throughput of CBR is about 64 kbps for different MVBR arrival rates. Figure 7(a) shows that most packets in the 5th layer video stream for UVBR are dropped when an arrival rate is 0.070 (flows/sec); therefore, TCP receives more bandwidth. In the case of 0.075 (flows/sec), since a few of the packets of the 4th layer video stream for UVBR and more packets of the 5th layer video stream for MVBR are dropped, the TCP achieves the highest throughput. 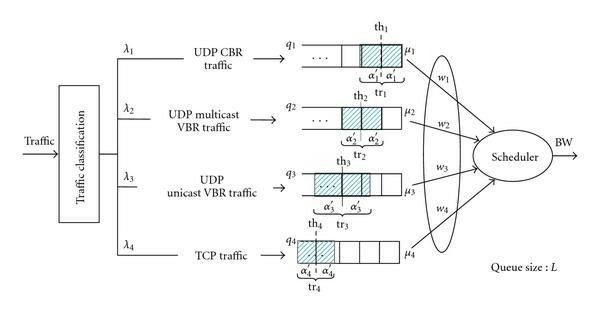 Since the arrival rate is higher than 0.085 (flows/sec), more packets of MVBR and UVBR are dropped, and the throughput of TCP is decreased due to increasing the total UVBR as the UVBR arrival rate increases. To compare with GRED-I, as shown in Figure 7(a), because the GRED-I cannot discriminate between the MVBR and UVBR, the packet dropping rates are almost the same for GRED-I_UVBR and GRED-I_MVBR. This is unfair for the multicast connection. Additionally, the video packets are dropped randomly which will cause poor system performance in light of the entire network average video quality. Figure 7(c) shows performance results in terms of throughput of the CBR, MVBR, UVBR, and TCP. The comparison of the TSAQM highlights better performance for MVBR, UVBR, and TCP with respect to the throughput. In particular, the proposed algorithms have taken into account the fairness and different weights for video layers. The insignificant video packets, that is, belonging to the 4th and the 3rd layer video streams, have higher dropping probability. To estimate video quality, the arrival rate of MVBR is varied from 0.06 to 0.14 (flows/sec), and the others are fixed and set to be 0.065 (flows/sec). Figures 8(a), 8(b), and 8(c) show the peak of SNR (PSNR) of Y, U, and V, respectively, for MVBR, UVBR, and system for different MVBR rates. According to Figures 8(b) and 8(c), the variation in PSNR for U and V is about 2.5 dB (i.e., between 36.5 dB and 39 dB). The decrease is more obvious for Y under an increasing CBR arrival rate, and the variation is about 6 dB, as shown in Figure 8. In addition, the values of MVBR are higher than UVBR for all cases because more packets of UVBR are dropped. In this paper, the proposed Traffic Sensitive Active Queue Management (TSAQM) is implemented in routers to overcome problems of current AQM algorithms. Based on the simulation results, several objectives of this proposed scheme are achieved including using a multi-queue, multi-threshold mechanism cooperating with a weight-based scheduler algorithm to meet the QoS requirement of high end-user utility for video service, which considers the multicast and adaptively adjusts the parameters of the TSAQM according to the time-varying traffic loads. Also, it shows that the TSAQM can achieve the QoS requirement in a time-varying Internet by adaptively adjusting the thresholds based on the traffic situations. Performance comparisons with the GRED-I are presented in terms of packet dropping rate and throughput to highlight the better behavior of the proposed schemes due to taking into account the fairness and different weights for video layers. Future research will emphasize several issues, most notably, implementation complexity, the same service class with diversity QoS and diversity capacities of downlink.